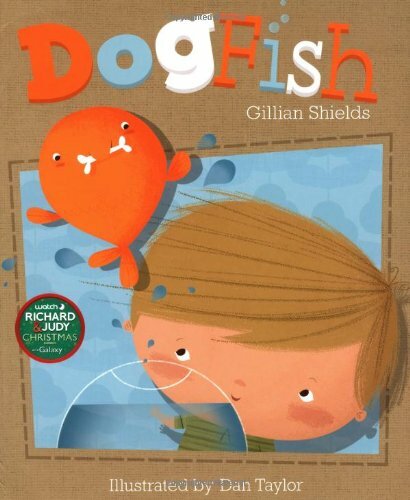 When a small boy tells his mum he needs a dog, mum cannot understand why when he already has a nice goldfish. But, a goldfish can’t catch sticks, go for walks, sit at your feet or wag its tail. There follows a dialogue between them interspersed with the boy’s own musings, mum putting up any number of practical reasons why a dog is out of the question and the boy vainly trying to counter them. Not even his hypnotising eyes can change her mind and it’s her final remark, ‘Well, if you can’t have what you want, you could try to want what you have.’, that causes him to look at things and his goldfish in a different way. Taylor uses simple circles, clear crisp lines and angular shapes to construct his striking, stylised mixed media illustrations that have a drollness of their own. Equally droll is the knowing manner of the telling and it is the combination of the two that make this such a splendid picture book.